Face: Brown eyes with rooted eyelashes, blonde eyebrows, dark pink lips and cheeks. Clothing: There were 3 variations - One piece swimsuit with white printed top and solid green bottom, Or one piece printed on white background or One piece printed on blue/green background. Notes: This body is prone to loose color and get very pale. 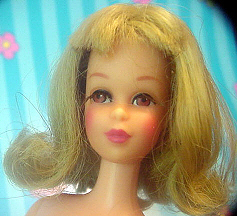 Mattel issued a reproduction of this doll in 1996 (in honor of Francie's 30th Anniversary).